This addon will display in the chat window the items that you and your group members have looted. It is for people who just want a standalone no-frills group loot logging feature without any unwanted baggage. This is a tiny addon (a mere couple of kilobytes) with virtually zero footprint. 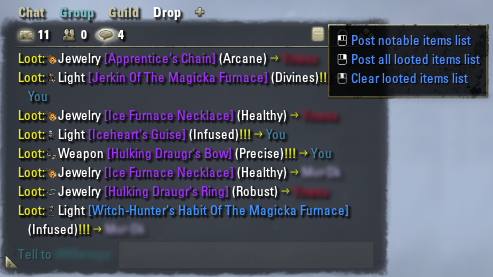 Group Loot Notifier will only show notable items: specifically, set items of any color quality, consumables or trophies of blue quality or better (e.g., motifs, recipes, and treasure maps), and any item of purple quality or better. - Motifs are now do not hides by "Filter in group"
Is it possible to add a button to auto thanks the guy, same way as "beg item" ? Click his name in chat, type "Thank you", press "Enter". Ok I'll do it myself Snow White. Thanks for the great addon. it shows out of date could you update it plz ? No necessary, cause no changes. "Out of date" it is just cosmetic function of add-on selection window. outfit style page drop - its Show Collectible option? Localisation for your language was missed. Fixed. Looks like it happens only if you have no savedvariables, works 2nd login but when I remove them the error comes back. Last edited by Tonyleila : 08/29/18 at 03:46 PM.